Every Interest Officer canidate to www.bsmrau.edu.bd or www.bdresultjob.com at download and print their application form 2 (copy) 6 (six) set. 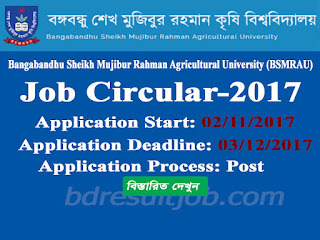 Only Bangabandhu Sheikh Mujibur Rahman Agricultural University (BSMRAU) Office determinate ‍application form can apply otherwise application will not accept. a. Passport size 3 (Three) Copy Photo Attached Appliaction Top Righ Side (Attested 1st class govt. officer). b. Every Educational Qualification Certificate and Mark sheet Photocopy (Attested by 1st class govt. officer). f. Computer Training Certificate (if any). g. Experience Certificate (if any) all are A4 size paper photocopy Attached. h. Must mentioned on the envelope Post Name and Sender (Applicant) address. Bangabandhu Sheikh Mujibur Rahman Agricultural University (BSMRAU) Authority will send Admit Card Applicant Address. Also you can see update news at www.bsmrau.edu.bd. Bangabandhu Sheikh Mujibur Rahman Agricultural University (BSMRAU) Authority will send Admit Card Applicant Address. Admit Card mansion exam Seat Plan and Exam Center. Also you can see update news at www.bsmrau.edu.bd. Bangabandhu Sheikh Mujibur Rahman Agricultural University (BSMRAU) authority will be published at thier Official webiste notice board www.bsmrau.edu.bd. Tags: www.bsmrau.edu.bd, www bsmrau edu bd, Bangabandhu Sheikh Mujibur Rahman Agricultural University (BSMRAU) Job Circular 2017, BSMRAU Job circular, BSMRAU Job Admit card download, BSMRAU Job seat plan, BSMRAU job test mark distribuition, Bangabandhu Sheikh Mujibur Rahman Agricultural University (BSMRAU) Job circular, Bangabandhu Sheikh Mujibur Rahman Agricultural University (BSMRAU) job test result 2017. 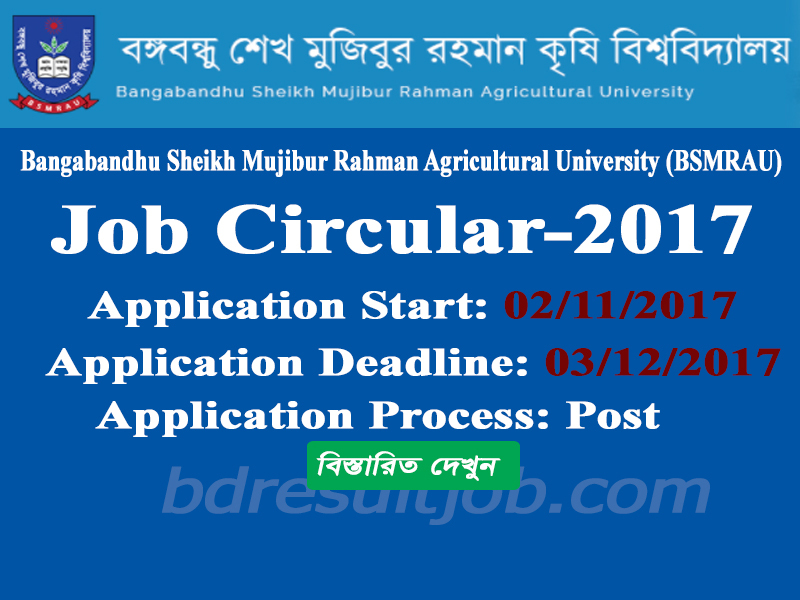 Bangabandhu Sheikh Mujibur Rahman Agricultural University (BSMRAU) Job Circular 2017, Bangabandhu Sheikh Mujibur Rahman Agricultural University (BSMRAU) Job Result, Bangabandhu Sheikh Mujibur Rahman Agricultural University (BSMRAU) Job Admit Card.